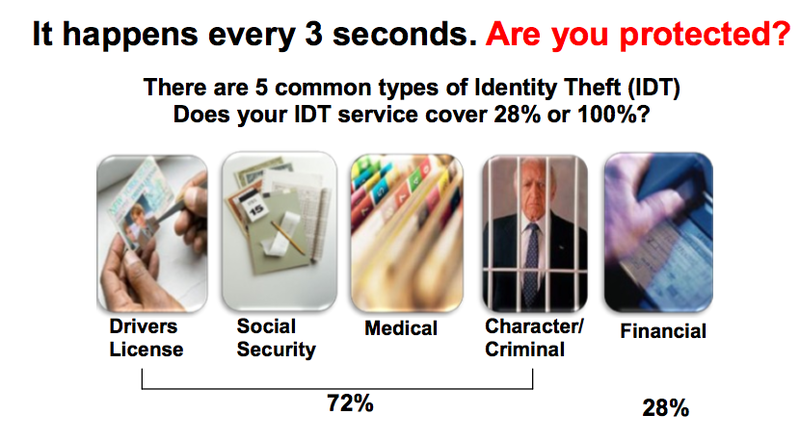 Most people are not getting the coverage they need from their identity theft service. According to Nathan Day, who represents Legal Shield, many companies monitor credit reports for people but don't watch other sources of potentional identity theft. Legal Shield has partnered with Kroll Worldwide, the global leader in risk mediation response, to provide comprehensive coverage that not only monitors the five areas of identity theft but also searches billions of records to protect a person's public persona. Identity theft has replaced the drug trade as the top money maker for organized crime. It is also the major money maker for terrorist organizations. Your driver's license sells for $150 to identity thieves, birth certificate $150, Social Security card $100, and medical insurance card $50. The first kind of identity theft is hijacking credit. Only 17 percent is detectable from credit reports. This kind of theft is difficult to detect and resolve because the thieves use every bit of information about a person, including Social Security number and birthdate, only with a new address. Vacant homes are often used as addresses. Because driver's licenses serve like a U.S. national identity card , they are sold worldwide and used to establish all other kinds of identity theft and fraud. Employment identity theft is particularly bad because it gets a person in trouble with the IRS. Dozens of people can use the same Social Security number to get work, and at year-end their income is reported as if it were the victim's income. A person can literally owe thousands of dollars in back taxes as a result. The fastest growing segment of identity theft is medical identity theft. A medical card can be like a $1 million dollar Visa; there is no limit to the amount that can be charged. The thief hijacks a person's medical history and leaves thousands of dollars in bills. The final kind of identity theft is character and criminal identity theft. Using someone's driver's license a thief can get speeding tickets, DUI's and even commit felonies. Warrants are issued for the arrest of the victims of the identity theft and it becomes difficult to prove that they didn't commit the cirme. Kroll Worldwide not only monitors and identifies the theft, but resolves all issues in the five areas of theft. The company monitors daily the three major credit agencies, watches the web for any unauthrozed use of a person's name or credit information, and checks billions of records to detact Social Security number fraud. For more information about identity theft watch the video at https://www.youtube.com/watch?v=OEXgMvwGVUI.